1. Slice the celery wafer-thin diagonally (use a mandoline if you have one). 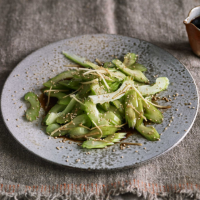 Combine the soya sauce, mirin, rice wine vinegar and sesame oil to make a dressing. Put the celery and ginger on a plate or in a shallow bowl, spoon over the dressing and scatter with the sesame seeds before serving. This recipe first appeared in the Harvest section of Waitrose Food, November 2017 issue. Download the Waitrose Food app for the full issue. This recipe was first published in Wed Nov 01 13:06:00 GMT 2017.